ReutersAbu Dhabi Crown Prince Sheikh Mohammed Bin Zayed Al Nahyan (C) watches the closing ceremony during joint military manoeuvres between the UAE and the French army in the desert of Abu Dhabi on May 2, 2012. 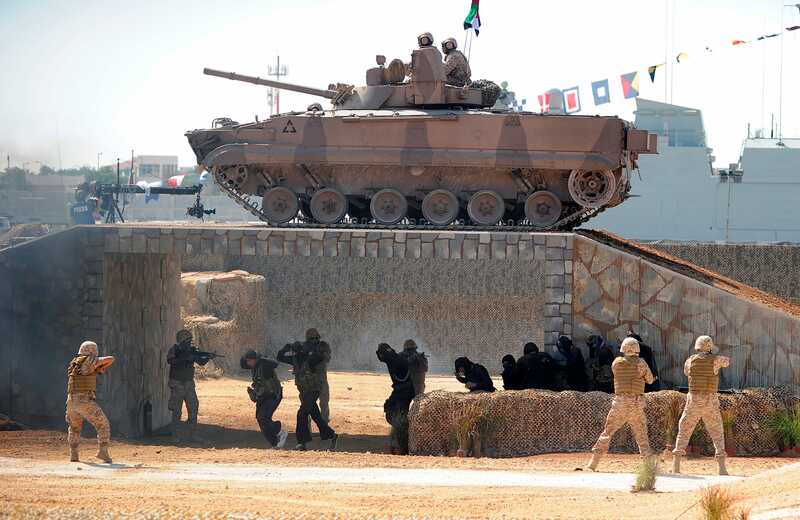 The United Arab Emirates is flexing its military muscle in a chaotic, post-Arab Spring Middle East. What was once a nation with a limited presence on the international stage is acquiring advanced weaponry, instituting universal military service, and expanding its fleet of fighter jets and heavy vehicles. A country of less than 10 million citizens has even proven willing to frequently use military force around the region. The biggest sign of this came in August, when the UAE cooperated with Egypt to bomb Islamist militias vying for the Libyan capital; the Emirates had contributed a dozen aircraft to the international campaign that helped oust Libyan dictator Muammar Gaddafi back in 2011. Also in 2011, it contributed troops to the multi-national force that crushed a peaceful uprising in Bahrain in 2011 and the country is involved in anti-ISIS operations as well. The UAE had the 15th-highest military expenditures of any country in the world in 2013 according to the Stockholm International Peace Research Institute. Its military spending has nearly doubled in the last ten years; behind Saudi Arabia it enjoys the second biggest defence budget of the oil-rich Persian Gulf states at more than $US14 billion. It’s also on pace to become the world’s third-largest defence importer in 2015. A network of monarchical city states that includes Dubai and Abu Dhabi is now the rising military power in the Middle East. ReutersSmoke is seen after United Arab Emirates F-16 fighter jets fired missiles during joint military manoeuvres with the French army in the desert of Abu Dhabi May 2, 2012. The UAE has backed up its military expansion with an assertive and independent-minded foreign policy. At the same time, the US working with UAE as an ally in the fight against ISIS. It’s one of five Arab nations to contribute to bombing efforts against the group, and the country hosts Australian fighter jets on its territory. The US also bases aircraft at Al Dhafra airbase, outside of Abu Dhabi. The Emirates are involved in intelligence efforts to counter ISIS’ expansion. Last week the country’s foreign minister, Sheikh Abdullah bin Zayed al-Nahyan, warned of a potentially growing link between ISIS and al-Shabab, an Al Qaeda subsidiary operating in the Horn of Africa. “As groups like Daesh [Islamic State] develop ties to criminal networks and arms networks like al-Shabab, it is essential that we prevent them from expanding their operations into the sea and threaten vital channels such as the Strait of Hormuz, the Red Sea, Bab al Mandab and the Gulf of Aden,” he said at a conference on counter-piracy in Dubai. 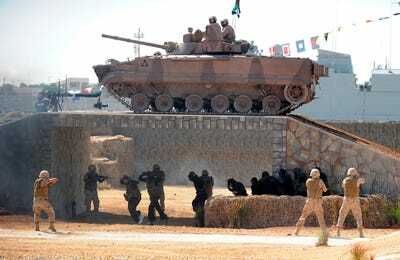 Ben Job/ReutersMembers of the United Arab Emirates’ armed forces participate in the opening ceremony of the International Defence Exhibition and Conference (IDEX) on Feb. 17, 2013. 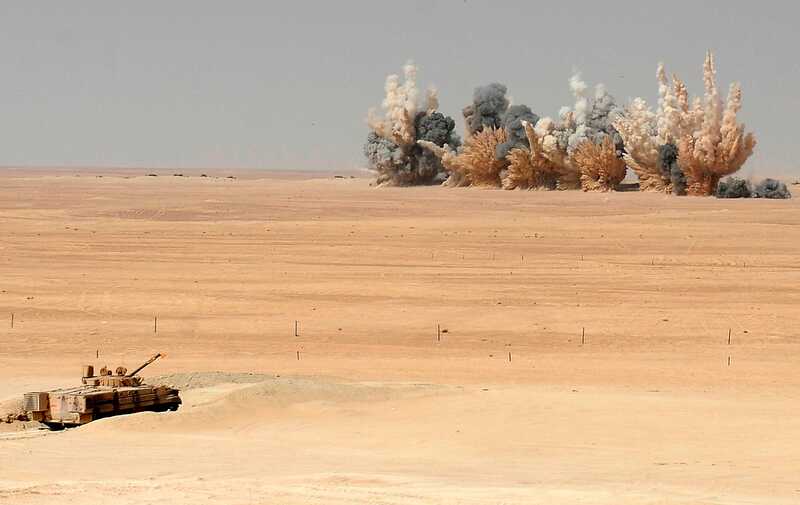 The UAE, Egypt, Saudi Arabia and Kuwait are even in talks to form a coalition “not intended to intervene in Iraq or Syria but to act separately to address other extremist hot spots,” according to the AP. Budding conflicts cited by anonymous Egyptian military officials included Libya and Yemen, where an Iranian-armed Shi’ite militia has taken over the capital. Iran actually helps explain why the UAE has expanded its military so rapidly. The UAE is mostly thought of as an economic power — Dubai is a center of world finance and the UAE has oil and gas deposits along with some of the busiest ports in the Middle East. But it’s just across the Persian Gulf from Iran, a country with which it actually has a number of outstanding border disputes. The UAE’s purchase of new ships and aircraft from the US, an upgrade of its F-16 force — which now boasts some of the most advanced versions of that aircraft in use anywhere in the world — and its interest in the F-35 fifth-generation fighter jet may give it a qualitative military edge over its much larger and geopolitically meddlesome neighbour. 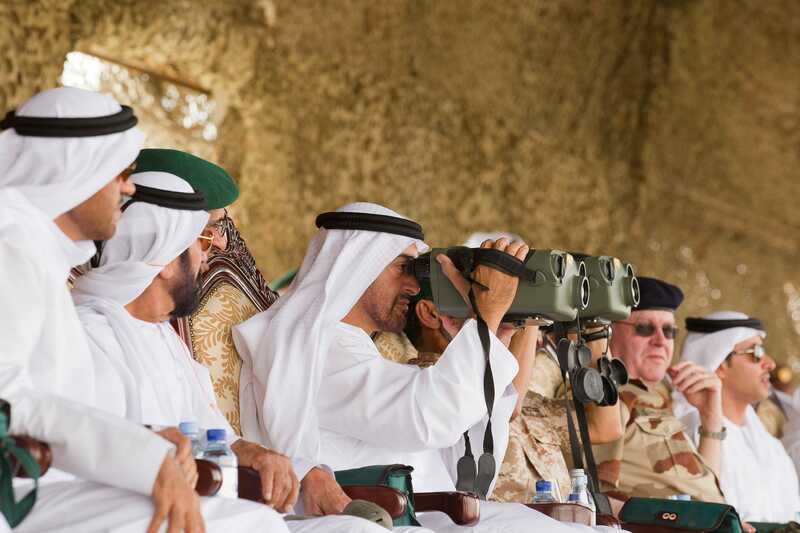 The UAE could be also be using its military buildup to project power and jostle for greater prestige in the wider global community. That could explain why Abu Dhabi has such vaunted ambitions around one other traditional marker of national greatness: space exploration. In July the country announced that it would create a space agency by 2021 and planned on sending a probe to Mars. 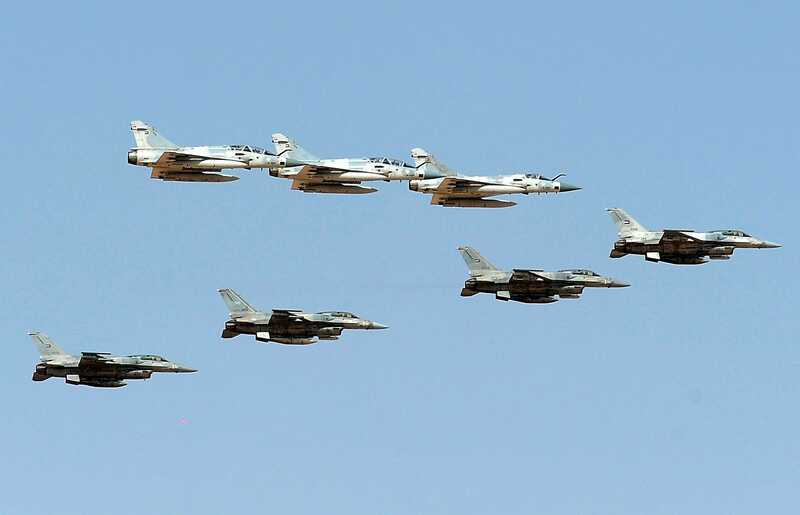 ReutersFrench-made Mirage 2000 and U.S.-made F-16 fighter jets of the United Arab Emirates forces take part in joint military maneuvres with the French army in the desert of Abu Dhabi May 2, 2012. But the Emirates might be looking a bit closer to home, too. The Arab Spring proved that none of the region’s leaders were totally safe from internal turmoil — and demonstrated that the Middle East’s political and security climate could shift in ways that almost no one can predict. 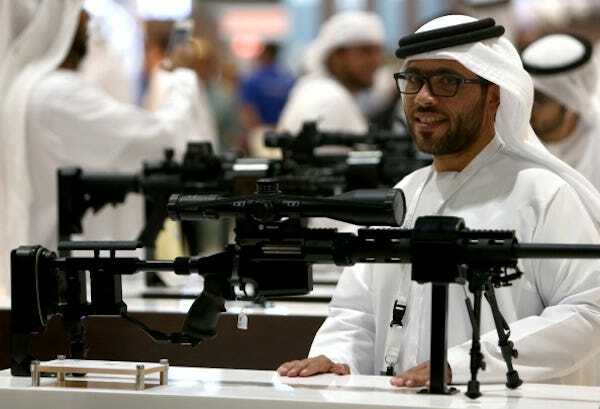 Warren Little/Getty ImagesA visitor is pictured looking at assault rifles during the Abu Dhabi 2014 International Hunting & Equestrian Exhibition on Sept. 11, 2014. The UAE has used a degree of internal oppression to solidify its situation in an unstable region, arresting dozens of Islamist activists, and exiling secular voices of dissent, like the once Dubai-based Arab Spring activist Iyad al-Baghdadi. The country’s conservative rulers see Islamists as a threat to the existing state system in the Middle East, which explains the UAE’s willingness to carry out airstrikes against militants in Libya and Syria — and its hostility towards Islamist parties at home. Also on the domestic front, the UAE introduced mandatory conscription this past June for males between the ages of 18-30. Those with a high school education must serve for nine months, and those without for a full two years. The UAE is an autocracy in a time when no Middle Eastern government’s rule seems totally secure. And it’s a fairly prosperous country in a region where threats can emerge without warning. Its rapid militarization and assertive security policy is a way of keeping its edge in this uncertain environment.